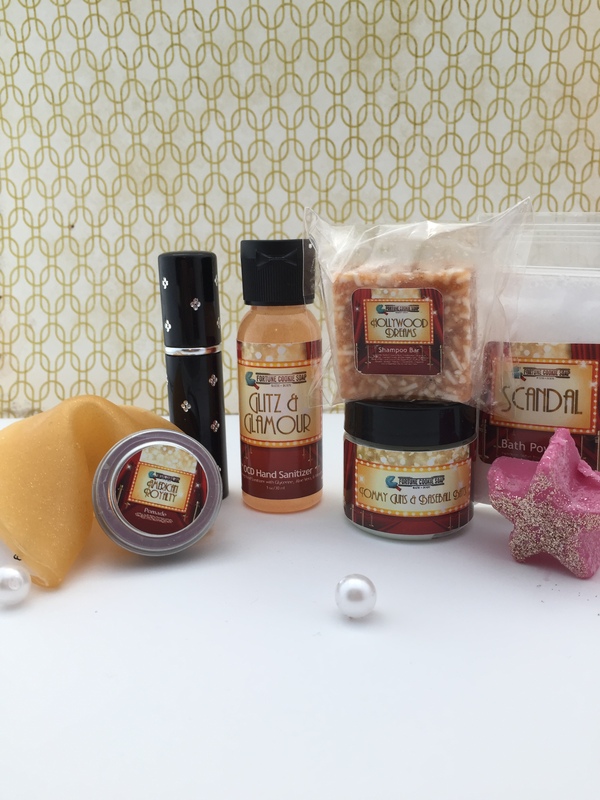 The Fortune Cookie Soap Box is a quarterly subscription where seasonal bath, beauty, and skincare products are sent out before the launch of Fortune Cookie Soap’s new collection. This subscription costs $19.99 and is billed about every three months. Each box comes with about 8 sample to full size products to try from the upcoming launch. It also includes a $10 off discount card to spend at the store. You can read my other reviews of Fortune Cookie Soap Boxes here. 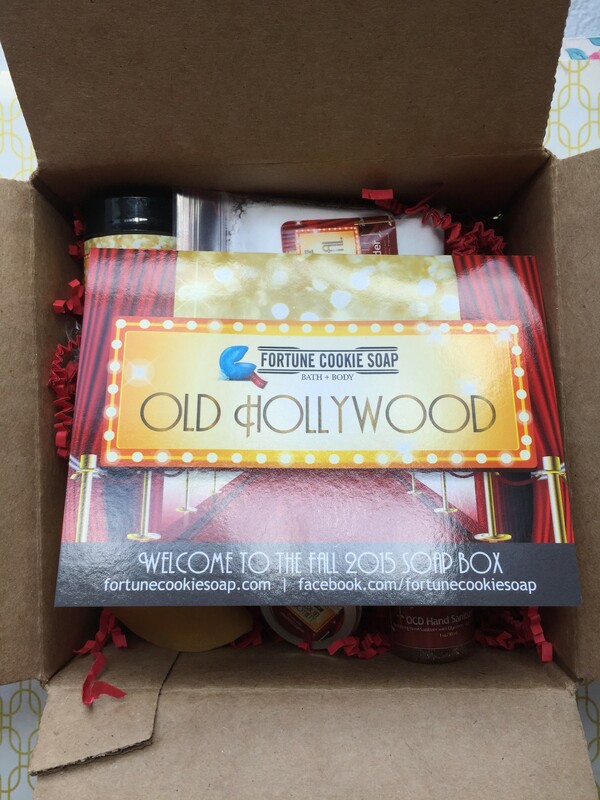 Though the current box is sold you, you can sign up for the Winter Soap Box here! 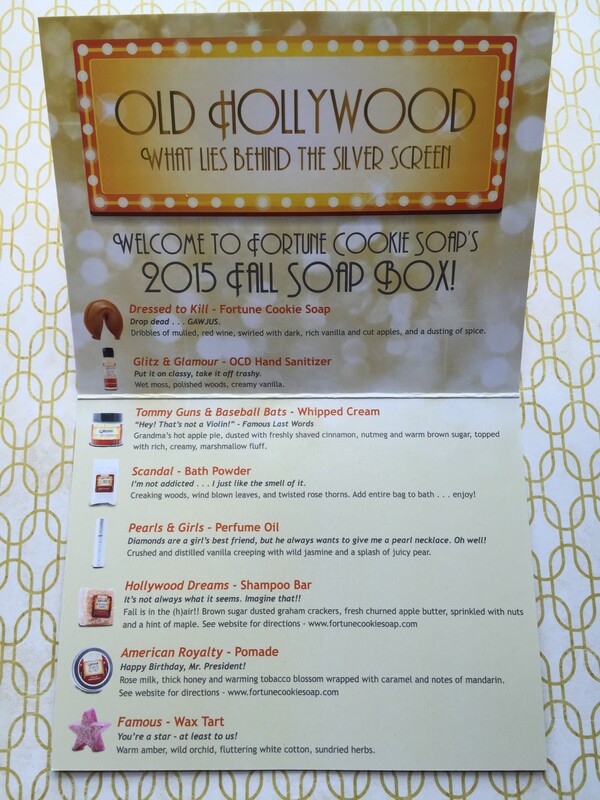 Fun Stuff: The fall box was Old Hollywood theme. 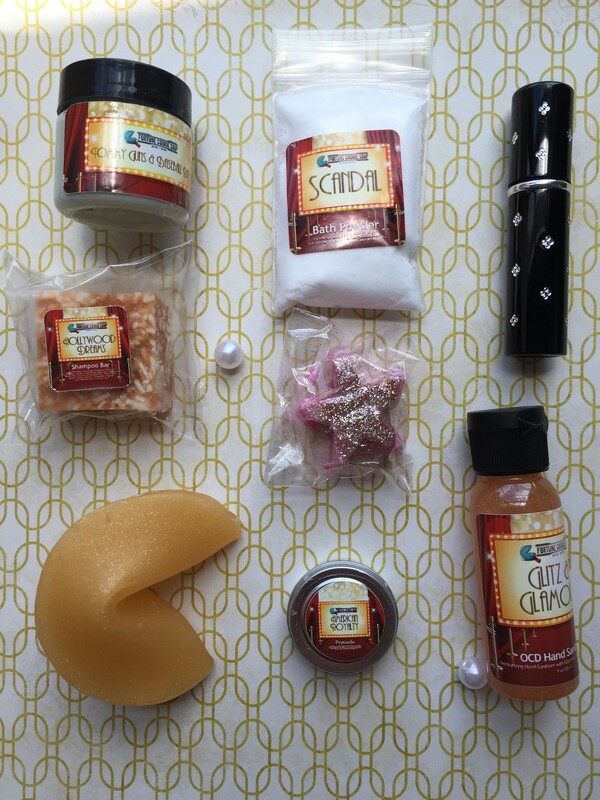 I always love how adorable and creative the packaging and themes are on the Fortune Cookie Soap boxes. Nicely printed informational card with my discount code on the back! The goods all spread out! Dressed to Kill- Fortune Cookie Soap- Dribbles of mulled, red wine, swirled with dark, rich vanilla and cut apples and a dusting of spice. This is a simple, but pretty fortune cookie soap in a glittery yellow. I think it smells like soft, clean fall. Very subtle, but nice. 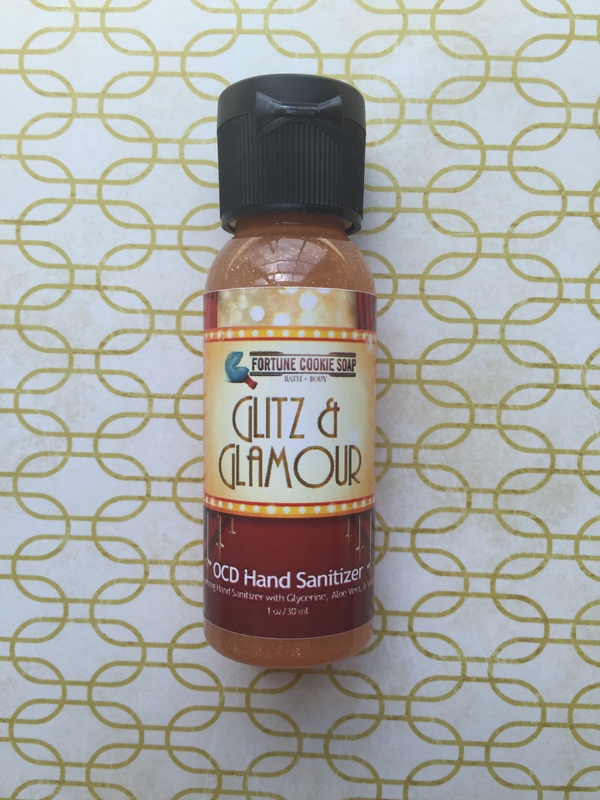 Glitz and Glamour OCD Hand Sanitizer- Wet moss, polished woods, and creamy vanilla. The OCD hand sanitizers are fun and smell pretty awesome, be warned this one has glitter in it. I actually like the smell of this, it reminds me of the woods in fall. Not what you would expect for a hand sanitizer scent, but delightful anyway. Tommy Guns and Baseball Bats- Whipped Cream-Grandma’s hot apple pie, dusted with freshly shaved cinnamon, nutmeg, and warm brown sugar, topped with rich, creamy, marshmallow fluff. 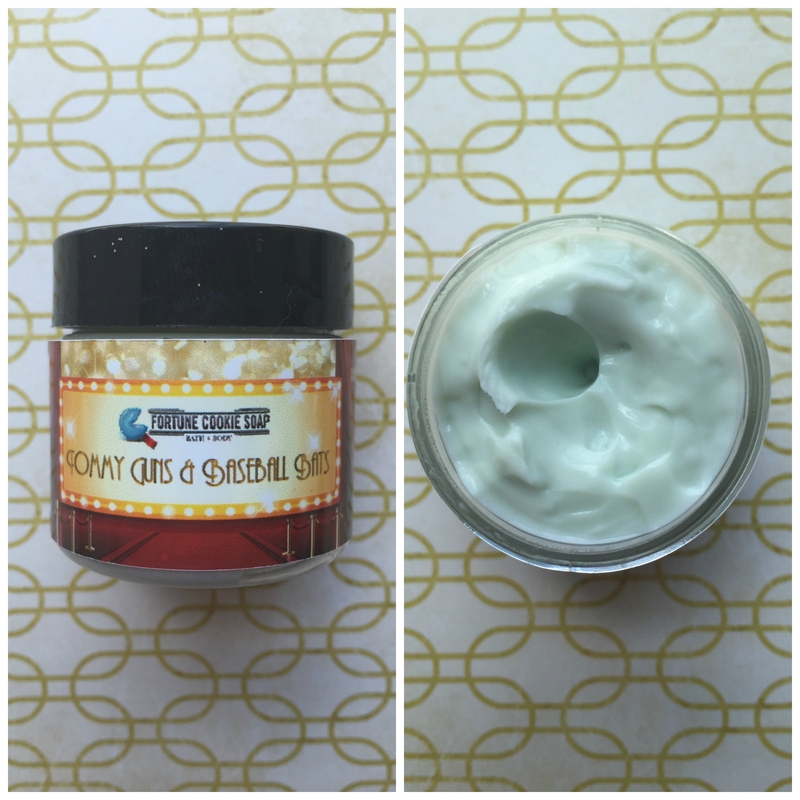 Scandal- Bath Powder (not pictured because I got excited and used it before photographing it. WHOOPS.) Creaking woods, wind blown leaves, and twisted rose thorns. 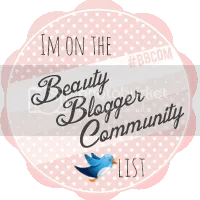 If you’ve been around my blog for awhile, you may know that I do love me a bath. I was quite pumped when I saw bath powder included in this box. I still haven’t figure out exactly what bath powder does, (I think it is supposed to make your skin feel smooth), but I still like any excuse for a bath. This smelled clean and fresh, like a nice cool day. It was pretty subtle, but refreshing for a bath. 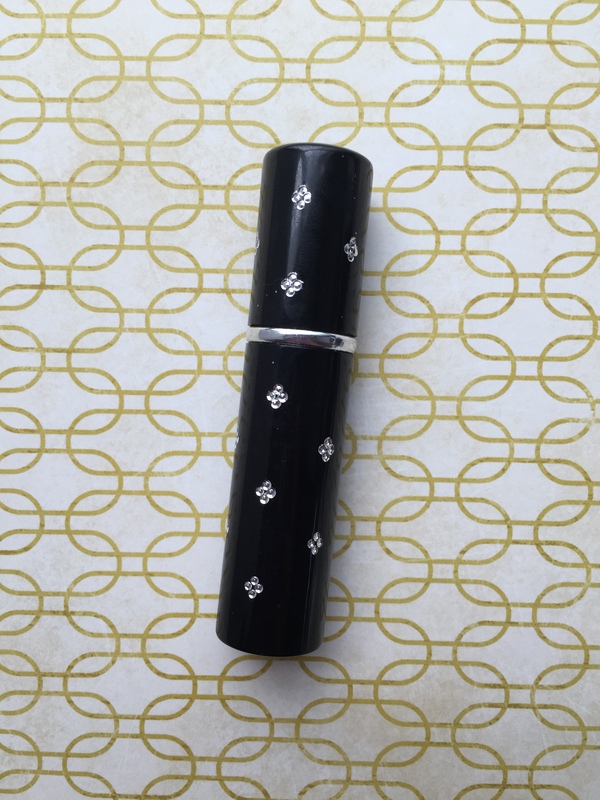 Pearls and Girls-Perfume Oil- Crushed and distilled vanilla creeping with wild jasmine and a splash of juicy pear. I love the vial this is in, it’s such a great little spray bottle that seems sturdy enough to live in my purse, (which is a death trap for most cosmetics). The perfume itself has very good throw on me and lasted several hours. 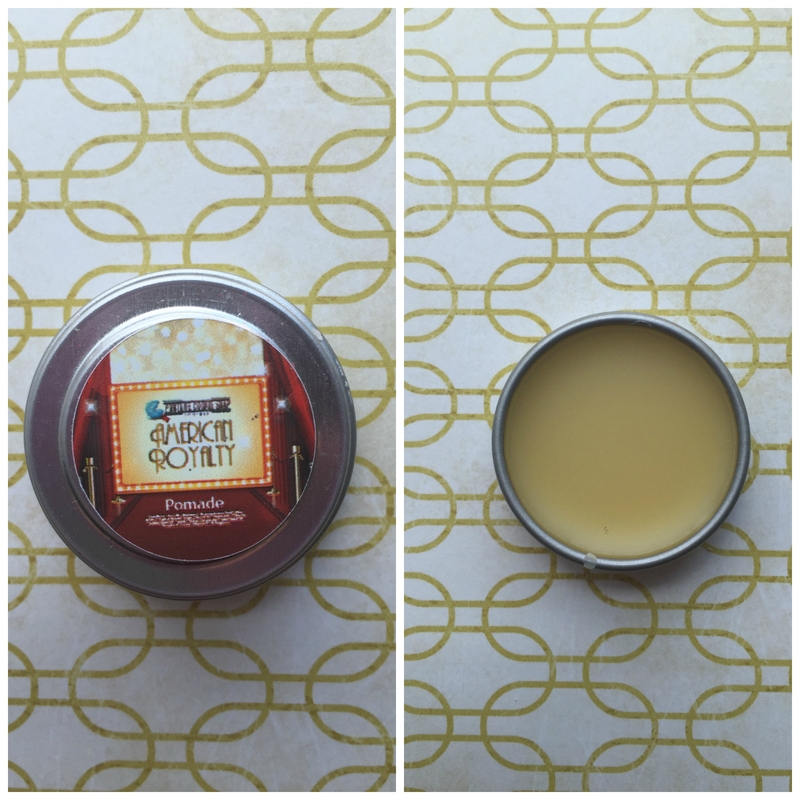 It smells just like vanilla and pears, it’s a pretty simple scent, but not bad. Just nothing too exciting. 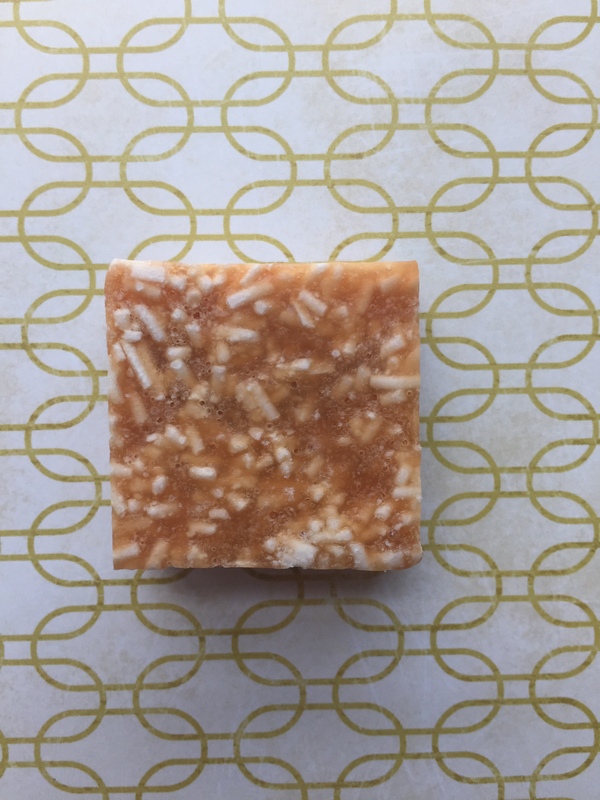 Hollywood Dreams- Shampoo Bar– Brown sugar dusted with graham crackers, fresh churned apple butter, sprinkled with nuts and a hint of maple. I’ve never used a shampoo bar before, so let’s assume that I used it right. Which-who knows? But I can at least tell you this smells exactly like the most delicious fall dessert you’ve ever smelled. It’s so sugary sweet, with warm brown sugar and maple notes. I reallllly want this scent in everything. I actually really like this pomade, it’s good for texturing hair. It also has the added bonus of smelling kind of line Tobacco and vanilla. It’s going to take my whole life to get through one tiny jar of this, though. I don’t use much pomade. Lopsided, but it was the only way I could get the powder to stand up! As always, the OCD and Whipped Cream products are my favorite, although the Whipped Cream scent wasn’t the biggest hit with me. Hollywood Dreams is by far my favorite scent and I want to buy EVERYTHING in it from the Fall Launch. The other scents were nice and sophisticated, and they seemed to mostly be very subtle, subdued fall scents. I personally prefer big, loud “IT IS FALL” in your face type of scents. Pumpkin, cinnamon, crunchy leaves for days, please. Hence, my desire to buy everything in Hollywood Dreams. That’s it for today! 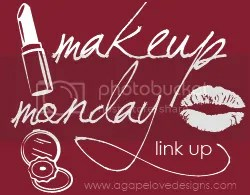 Happy Hour this week will be another Sunday Funday! 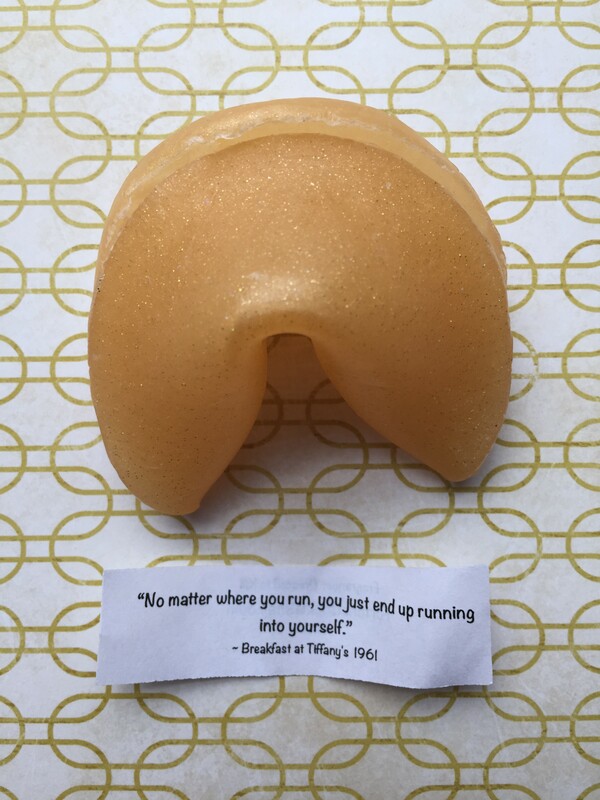 -Are you buying anything from the Fortune Cookie Fall Launch? -Did you have a favorite product out of all of these? -What’s your favorite fall scent? Thanks for this review! I waffled on getting the FCS box but ultimately didn’t but I’m pretty sure that I need whipped cream in a couple of these scents. And I may need to stock up on OCDs too. Basically give me all the fall things!